I have this bad habit of adding too much garlic to the pesto. It ends up being this process that much resembles when one (me) cuts her own bangs. Too much trimmed from the left side (too much garlic) causes a bit more to be taken (more basil, walnuts, cheese, and olive oil added) off the right side to even it out a bit. A tad too much is cut from the right than intended (too much basil! there is garlic in here?) and here we are at the beginning again, on the left side (add more garlic) and the whole cycle continues until I am nearly bald (and I have 3 cups of pesto and zero parmesan cheese remaining for snacking on later). Trying to hide a botched bang trimming is one thing and can be done with hair clips and bobby pins and a bit of creativeness and often times, an explanation to your hair dresser the following afternoon as he stands behind you trying suppress a good belly laugh. Too much pesto, however, isn’t really a problem now is it? For one, it freezes like a dream…so hiding your ‘mistake’ behind the bananas and frozen Indian dinners is not so much an issue. Secondly, I find I like everything better when slathered in pesto. Eggs, sweet corn, toast, pasta, vegetables, crackers. It becomes my condiment of choice when I have multiple jars of it hanging out in the fridge. Thirdly, friends and neighbors are more than happy to relieve you of the pesto burden…however, I am rather reluctant at this and only consider this possibility if I am leaving town and my freezer is broken. This past weekend, with a Saturday afternoon empty with no expectations beyond creating a complete disaster in the kitchen, which I accomplished in such a way that I surprised even myself. The entire day I was hoping my phone wouldn’t ding with a notification that a prospective buyer wanted to visit and take a look at my house, as it took a bit of time to undo my mess. Did I tell you that I am selling my house? Well, I am! More on that on a later post. I am in the beginning and there is much cleaning and then keeping it clean and getting comfortable-ish with strangers traipsing through my bedroom while I am at work or reading at the coffee shop down the street. It is all very weird, but so very good. Seeing the sign in the front yard this week made it all so real and the feeling of a burden being lifted was felt. I love this house but it has never felt like a home. But anyways, back to the pesto predicament. 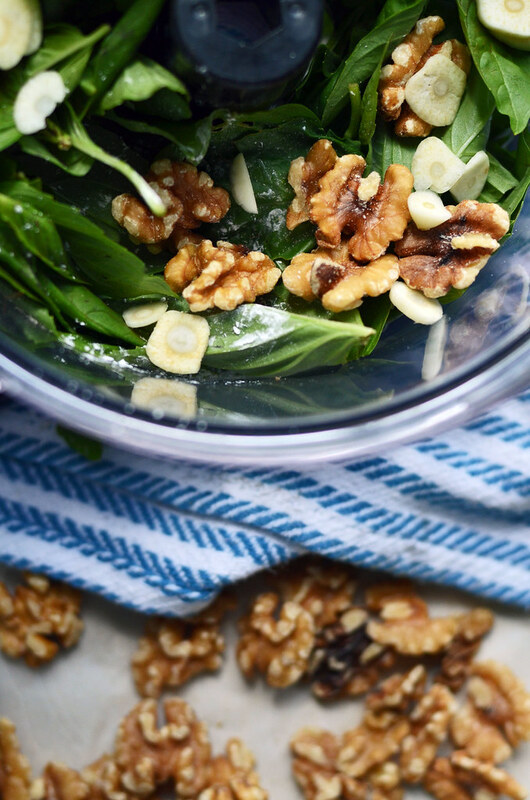 Surprise, surprise…I whirred together more basil, walnuts, olive oil, garlic, salt, and parmesan cheese than I needed. So, when I only intended and prepped for one or perhaps two caprese salad grilled cheese sandwiches to be panini’d on Saturday, it has become a week of all things caprese-ish including more sandwiches and the purchasing of more tomatoes and mozzarella, too which I may have bought too much of as from my vantage point right now, the tomato to pesto ratio is a bit one sided. And another crazy cycle begins. 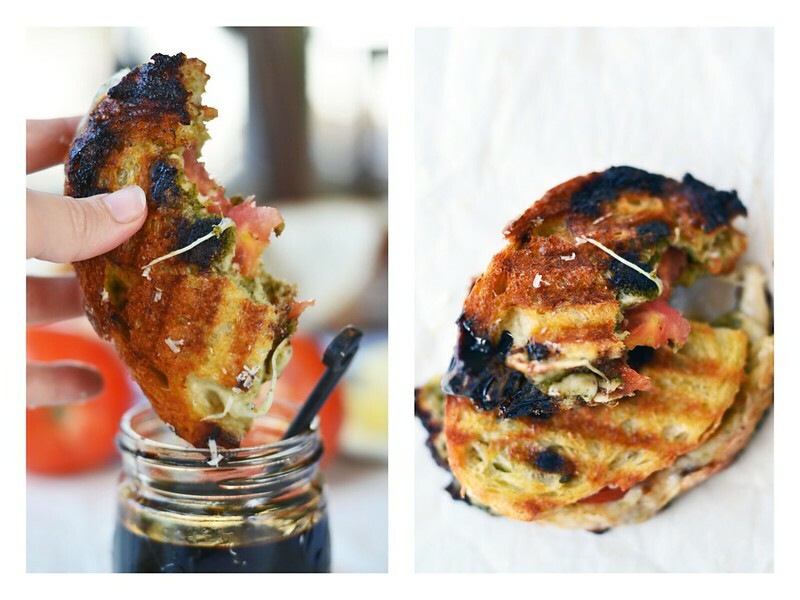 A caprese salad grilled cheese is nothing more than thick slices of crusty bread slathered with a bit of butter on one side and then flipped over to where a generous amount of pesto is applied. Layered upon the pesto is creamy mozzarella and sun ripened tomatoes and a drizzle of sweet tangy balsamic glaze and finally more mozzarella. A panini press does wonders to smoosh it all together but a brick wrapped in tinfoil will do the same work, that of marrying the best flavors of summer into a handheld feast for one. I recommend making these as soon as possible as summer is slowly pulling away from us. I can feel it in the air tonight. Preheat panini press according manufactures directions or heat a pan on the stove over medium high heat. Spread ½ tablespoon of butter on one side of one slice of bread. 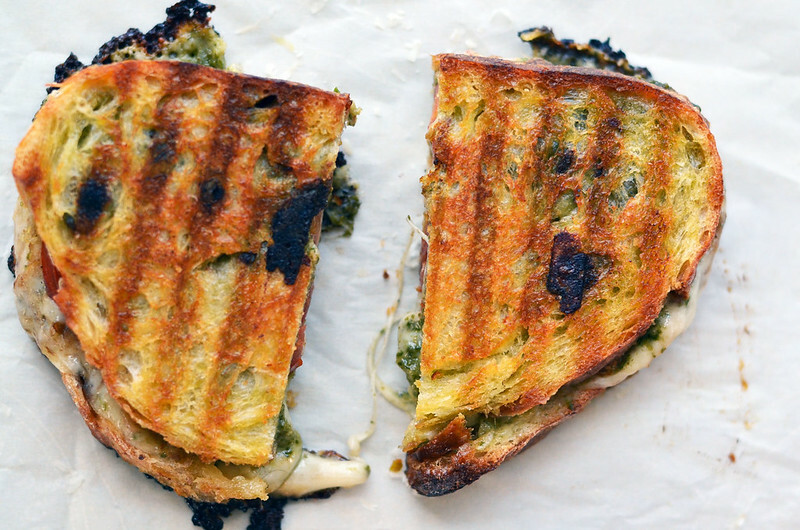 With butter side facing down, spread 1 tablespoon of pesto onto bread. 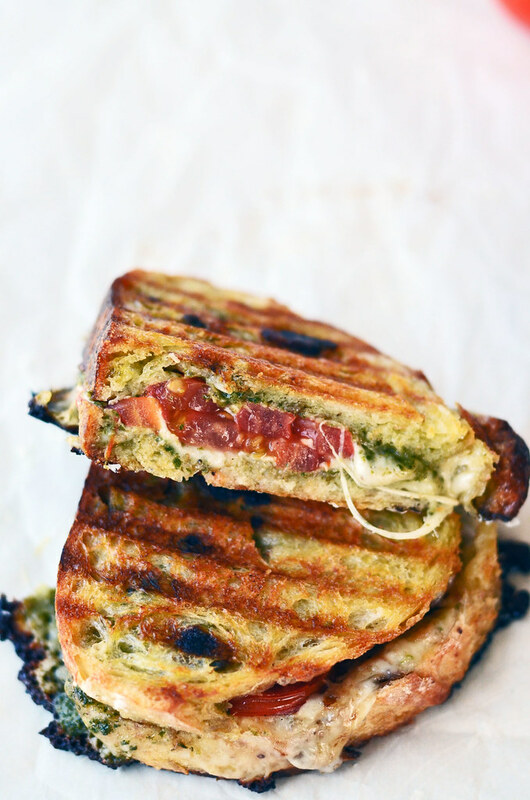 Layer half of mozzarella onto pesto followed by slices of tomato. Drizzle tomatoes with balsamic glaze. Cover tomatoes with remaining mozzarella. Spread the remaining tablespoon of pesto onto one side of the final piece of bread and ½ tablespoon of butter onto the opposite side. Place pesto side down on top of the mozzarella so butter side is facing up. 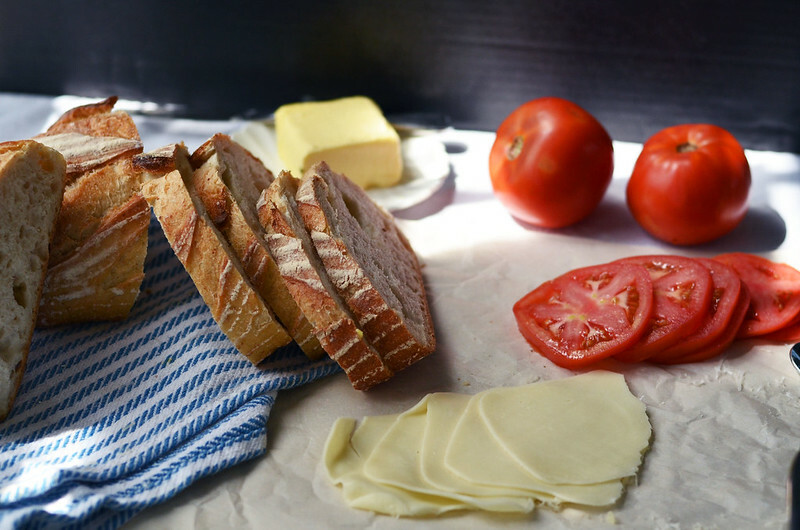 Transfer sandwich to panini press and grill according to manufactures directions or until cheese is melted and the bread is a deep golden brown. If using a pan and a stovetop. Place sandwich in pan and place a tinfoil covered brick or heavy saucepan atop the sandwich. Cook on one side until bread is a deep golden brown and cheese is beginning to melt. If the bread is browning at a faster rate than the cheese is melting, decrease flame. Flip sandwich, and cook on the opposite side until a deep golden brown is reached and the cheese is melted. Remove sandwich from cooking device (panini press or stove top) and let rest for at least 5 minutes before slicing in half and enjoying! Pesto recipe and balsamic glaze . For the pesto, I find that 2 cloves of garlic is often times too much and would begin with just one and tasting before adding a second.